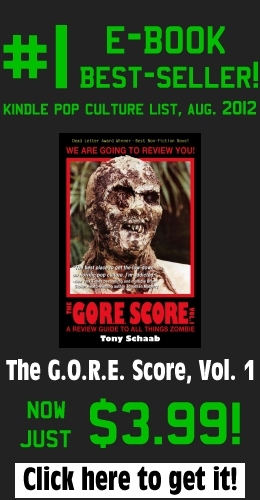 Reading World War Z: An Oral History of the Zombie War (reviewed on The G.O.R.E. Score previously, click here) by Max Brooks, a graduate statistical mechanics class inspired a group of Cornell University researchers to explore how an “actual” zombie outbreak might play out in the U.S.
During the 2015 American Physical Society March Meeting, on Thursday, March 5 in San Antonio, Texas, the group will describe their work modeling the statistical mechanics of zombies—those thankfully fictional “undead” creatures with an appetite for human flesh. Why model the mechanics of zombies? “Modeling zombies takes you through a lot of the techniques used to model real diseases, albeit in a fun context,” says Alex Alemi, a graduate student at Cornell University. Alemi and colleagues’ work offers a nice introduction to disease modeling in general, as well as some techniques of statistical physics for measuring second-order phase transitions. “It’s interesting in its own right as a model, as a cousin of traditional SIR [susceptible, infected, and resistant] models—which are used for many diseases—but with an additional nonlinearity,” points out Alemi. All told, the project was an overview of modern epidemiology modeling, starting with differential equations to model a fully connected population, then moving on to lattice-based models, and ending with a full U.S.-scale simulation of an outbreak across the continental U.S. It involved a lot of computational results generated from simulations the researchers wrote themselves. “At their heart, the simulations are akin to modeling chemical reactions taking place between different elements and, in this case, we have four states a person can be in—human, infected, zombie, or dead zombie—with approximately 300 million people,” Alemi explains. The project’s large-scale simulations are stochastic in nature, meaning that they have an element of randomness. “Each possible interaction—zombie bites human, human kills zombie, zombie moves, etc.—is treated like a radioactive decay, with a half-life that depends on some parameters, and we tried to simulate the times it would take for all of these different interactions to fire, where complications arise because when one thing happens it can affect the rates at which all of the other things happen,” he says. Cities would fall quickly, but it would take weeks for zombies to penetrate into less densely populated areas, and months to reach the northern mountain-time zone. Unrelated to the article. Just a really, really good zombie movie. If you somehow happen to find yourself in the midst of a fictional zombie outbreak and want to survive as long as possible, Alemi recommends making a run for the northern Rockies. While not an entirely practical implication, it’s “fun to know,” he says, and points out the benefits of applying hard science to fun topics—especially to help make learning more entertaining and enjoyable. What’s next for Alemi and colleagues? “Given the time, we could attempt to add more complicated social dynamics to the simulation, such as allowing people to make a run for it, include plane flights, or have an awareness of the zombie outbreak, etc.,” he notes.